I don’t know if anyone else has this problem, but I’m really struggling with my desire to knit for hours on end and my desire to get healthy. I mean, how does one balance working out and knitting times? This was more of a problem last week. I didn’t get near enough done on my shawl as I would’ve cared to. I think I managed 6 rows over the weekend, and maybe 10 over the course of last week. I did, however, manage to get the house clean and start to implement 10 minute workouts into my routine. I know 10 minutes doesn’t sound like much, but at my size and at my fitness level, it’s the way I’m trying to not overdo things. I’ve used knitting as a snacking deterrent in the past. It’s really great because those delicious, high-calorie snacks are often (though not always) very messy. 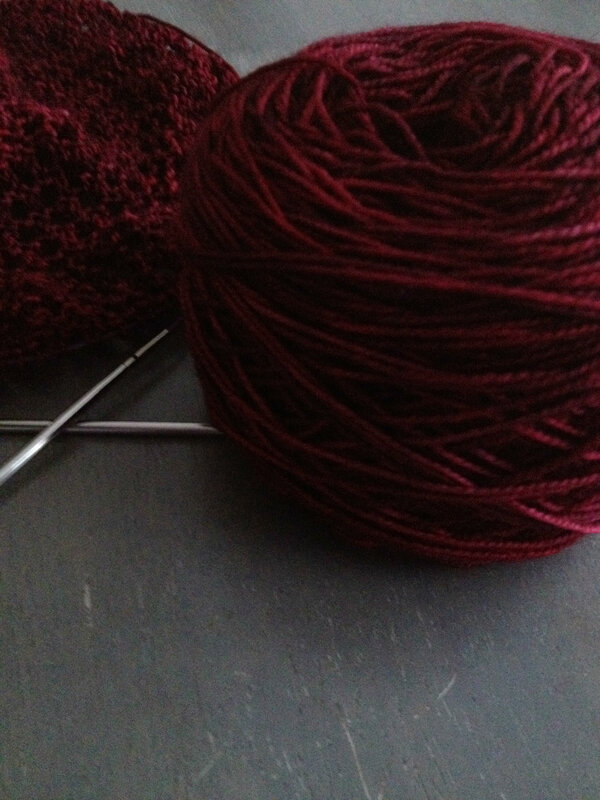 I don’t want my knitting to get messy, so I just stopped eating those things. Sounds like a pretty good plan, right? Less snacking = less weight gain, if nothing else. Bacon cheeseburgers, pizza, and goodness knows what all next for my meals, and the snacking deterrent wasn’t being much help anymore. I decided 2 weeks ago to kick things into gear. I started to increase vegetables, I dropped Diet Coke altogether (painful! ), and I told my husband that I couldn’t eat out for a while, and if we did, no burgers or pizza. Two weeks later, I’ve lost 7 pounds from eating healthy foods (but not depriving myself!) and cleaning house and general moving around. At no point did I overdo it, which surprised me. I never starved, and I never pushed myself so far beyond my limits as to be dangerous. This week, though, I want to fit in a walking routine with one of my friends. We’re planning to go in the evening before the sun is down, but at least after the hottest part of the day. Here in Texas, that’s still 90 degrees, though. I have up until we walk to do knitting, but it’s also the time to do housework. I’m not entirely sure how to balance this so I stay not only emotionally happy and calm from my knitting, but also implement the walking and fitness. How do you balance the two? Any tips? I agree! It’s so hard to fit in everything we want/need to do. Good luck with your walking plan!